When you place an order of just $35, you can get this set of 2 D-size stamps in one envelope for just $5! 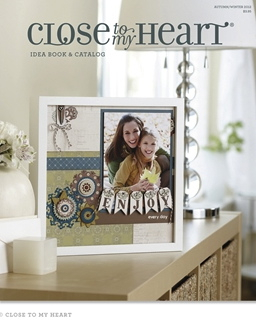 That's right, nearly 50 images that make it oh-so-easy to capture those everyday moments with a retail value of $35.90 for only $5! Don't delay, when September is over, so is this deal...contact me right away! Can you believe the summer is over and fall is here? I know I sure can't! My nieces (along with all of your kids, I'm sure) will be back in school tomorrow. I am ready for all the games, but I am not ready for summer to be over! 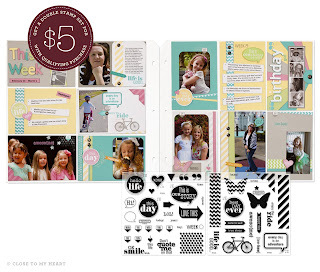 Contact me this month if you are interested in getting this stamp set for yourself. Once September is gone, so is this great set. 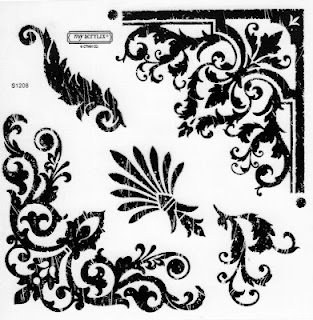 Today I will bring you some FABULOUS artwork using the new Baroque Borders Stamp of the Month. This is a set that you either love it or hate it. I was more on the hate it side (I know, I should never tell you something like that...) Well, let me just say that I have changed my mind. Sheri took this set and look at what she created with it!! She was really thinking outside the box this time around and created some wonderful artwork. She put it down on my table and I was wondering what it was for. Stamp of the Month NEVER even crossed my mind! That's how creative she got this time around. Did I tell you the truth or what? The day has finally come...you can shop now from this newest Idea Book. Isn't it beautiful? I think you'll agree that it is chock full of greatness. If you do not yet have your copy of it, let me know and I will be sure that you get one right away! If you just can't wait, just click here to visit my website and start shopping right away. Today is also the day that you can get this bag for free when you sign up to be a consultant on my team. You do need to hurry, though, as it is while supplies last! 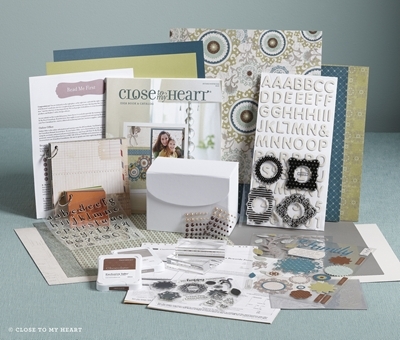 Close To My Heart now offers a new Essentials Consultant kit for only $49! Yes, you read that correctly. 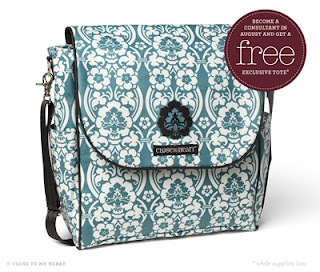 About $130 in products/supplies ($180 including that great damask bag) for only $49! You can also get the Master's kit for only $99. The choice is yours. I would love to welcome one and all to my team whether you are a business builder or a hobbyist. You know, I only signed up to get the discount on my own supplies, but have also enjoyed some wonderful 'extra income' from it, too :) Ready to sign up now, just click here to get started. Not ready yet and have a few questions, feel free to shoot me an email and I will get back to you with all the answers (or give you a call if you would rather). I am back from Dallas, Texas and our annual Close To My Heart Convention. OMG, all I can say is WOW! Every year I wonder how they are going to amaze me and every year they totally out-do themselves!! Want to know some of what's inside that new Idea Book? 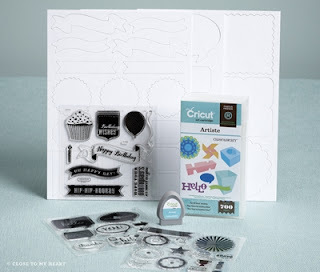 I just bet you do...how about a brand new, exclusive to CTMH Cricut Artiste Collection! Yep, you get all this for just $99 - or better yet, book your party in August and use your 1/2 price hostess rewards to purchase it! Yessiree, Bob! It could be yours for only $49.50 :) It has 698 brand new images for you to use. Do you like Studio J? Now you are going to like it even more! Membership fees have gone away and now they make it even faster, simpler, and easier for you. Try it out for FREE, just click here to get started. Be sure to let me know if you have any questions at all! Is organization your thing - or maybe you need some organization...we have just the ticket for you. You will want to see our brand new organizers and accessory boxes. They are awesome! Pigment inks? WE now have mini pigment ink pads that will be just perfect for decorating your home decor items. Yes, you heard me correctly, I said Home Decor Items! This is right up my alley as I love, love, love to do these types of items. Just wait till you see what I have to show you! PS-Check out these awesome new Damask Bags we got just for attending Convention! The weekend before the 4th was also spent with my family at the lake. What a beautiful day it was (although quite HOT). Yes, I said HOT! We had over a week of very hot and humid weather (and yes, I do still live in Wisconsin!) Our weather was hotter here than down south even! Here are a couple more recipes for you, too. The first is for S'more Bites. They were so easy to make and much neater to eat than the originals. Just as good, minus the campfire. Preheat oven to 350 degrees F. Place graham crackers into a large resealable plastic bag. Finely crush into crumbs. Combine graham cracker crumbs, powdered sugar, and butter in a small bowl. Place 1 tablespoon of crumb mixture in each cup of a mini muffin pan. Firmly press crumbs to form shallow cups. Bake 4-5 minutes or until edges are bubbling. 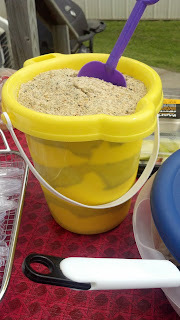 (I discovered how easy it was to form the shells by using my cookie scoop - 1 scoopful was just the right amount and the back of the scoop worked well to press them into the tin). Meanwhile, break two of the candy bars into rectangles. Remove pan from oven; place one rectangle into each cup. Cut marshmallows in half crosswise using shears dipped in cold water. Place one marshmallow half, cut-side down, into each cup. Return to oven 1-2 minutes or until marshmallows are slightly softened. Remove pans from oven to cooling rack; cool 15 minutes. Carefully remove cups from pan. Cool completely. Break remaining candy bars and place in small microwavable bowl. Microwave on high 1 to 1 1/2 minutes or until melted and smooth, stirring every 20 seconds. Dip the top of each marshmallow in melted chocolate. Turn top-side up and let stand 40 to 60 minutes or until set. Makes 24 cups. The next recipe is for Sand Pudding. You've heard of Dirt Cake? Well, same idea only it looks like sand instead of dirt. I found both of these recipes on Pinterest...imagine that!